Wonder was still in shock—he remembered how, when he was five, he first heard about King as he listened to coverage of the Montgomery bus boycott on the radio. “I asked, ‘Why don’t they like colored people? What’s the difference?’ I still can’t see the difference.” As a young teenager, when Wonder was performing with the Motown Revue in Alabama, he experienced first-hand the evils of segregation—he remembers someone shooting at their tour bus, just missing the gas tank. When he was 15, Wonder finally met King, shaking his hand at a freedom rally in Chicago. At the funeral, Wonder was joined by his local representative, young African-American Congressman John Conyers, who had just introduced a bill to honor King’s legacy by making his birthday a national holiday. 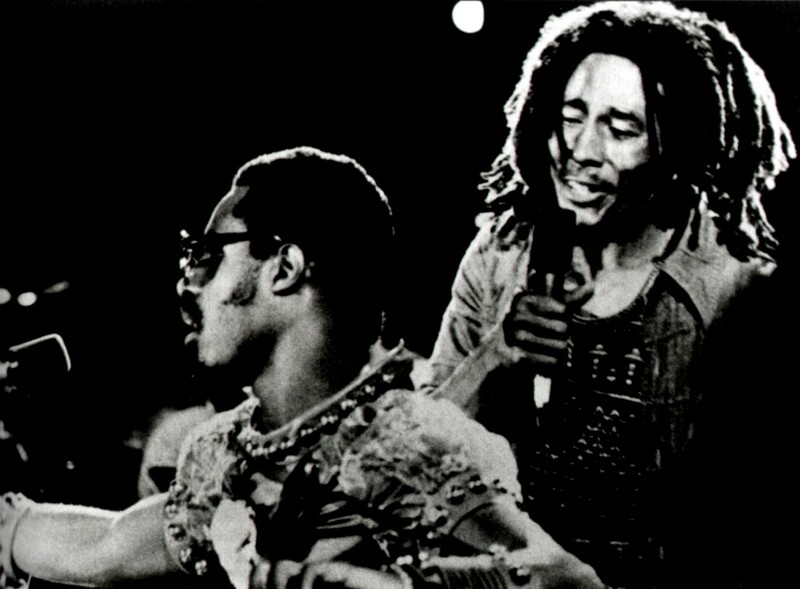 Thus began an epic crusade, led by Wonder and some of the biggest names in music—from Bob Marley to Michael Jackson—to create Martin Luther King Day. In the immediate wake of King’s death, the political establishment was more concerned with keeping things calm, tamping down unrest, and arresting rioters and activists. It was a violent year—that summer the Democratic convention in Chicago exploded in chaos and another inspiring leader, Robert F. Kennedy, was killed by an assassin. The country seemed on the verge of civil war. Conyers’ bill languished in Congress for over a decade, through years of anti-war protests, Watergate and political corruption, stifled by inertia and malaise at the end of the 1970s. The dream was kept alive by labor unions, who viewed King as a working-class hero, with protests that slowly built up steam. At a General Motors plant in New York, a small group of auto workers refused to work on King’s birthday in 1969, and thousands of hospital workers in New York City went on strike until managers agreed to a paid holiday on the birthday. 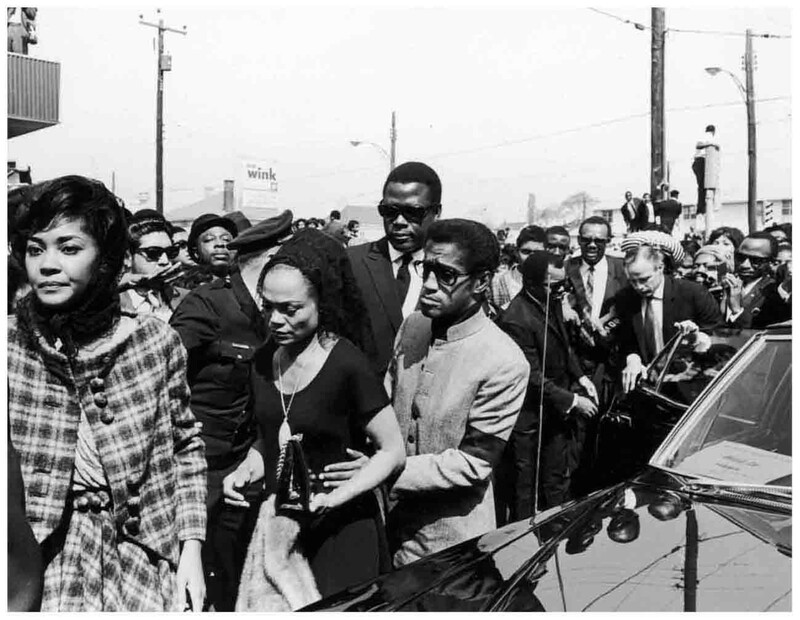 King’s widow, Coretta Scott King, led a birthday rally that year in Atlanta, where she was joined by Conyers and union leaders. By 1973, some of the country’s largest unions, including the AFSCME and the United Autoworkers, made the paid holiday a regular demand in their contract negotiations. Finally in 1979, President Jimmy Carter, who had been elected with the support of the unions, endorsed the bill to create the holiday. Carter made an emotional appearance at King’s old church, Ebenezer Baptist Church in Atlanta. But Congress refused to budge, led by conservative Senator Jesse Helms of North Carolina, who denounced King as a lawbreaker who had been manipulated by Communists. The situation looked bleak. The tour was full of extremes. When they played at Madison Square Garden in November, Wonder delighted the huge audience with a surprise guest—the Prince of Pop. Michael Jackson slid on to stage during the reggae rhythm of “Master Blaster” and the crowd screamed as he twirled “like a boneless ice skater,” remembered Scott-Heron. And when they played in Los Angeles a week later with Carlos Santana, Wonder had to somberly announce John Lennon’s killing that night to a stunned audience that soon started wailing and breaking down in tears. In a moving elegy, Wonder talked about their friendship and praised Lennon’s integrity, connecting him to King, drawing “a circle around the kind of men who stood up for both peace and change” and making the upcoming rally even more significant. 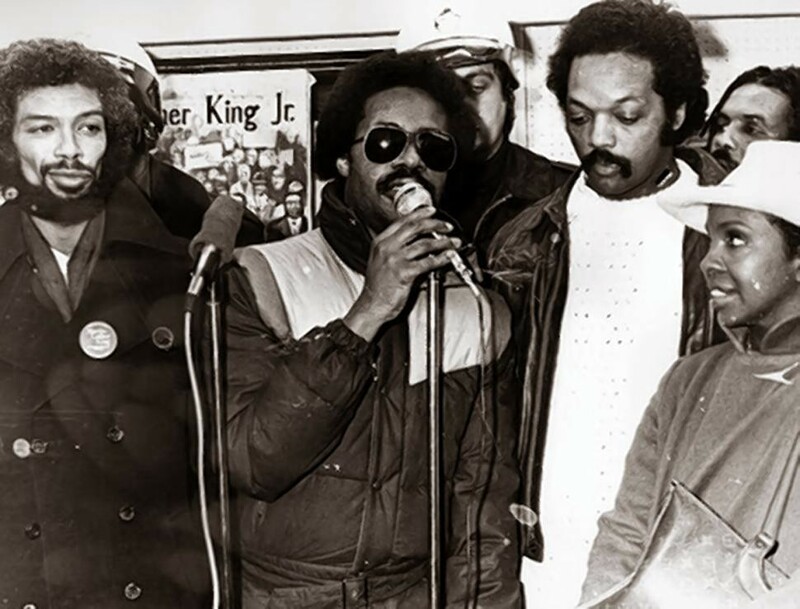 Stevie Wonder, Gil Scott Heron, Reverend Jesse Jackson, Gladys Knight and Sam Courtney at a press conference at Rafu Gallery, Washington, DC, January 15, 1981. At that point, the rhetoric had grown so incendiary that even moderates in opposition felt compelled to express their support for the holiday. The bill passed, 78 to 22. 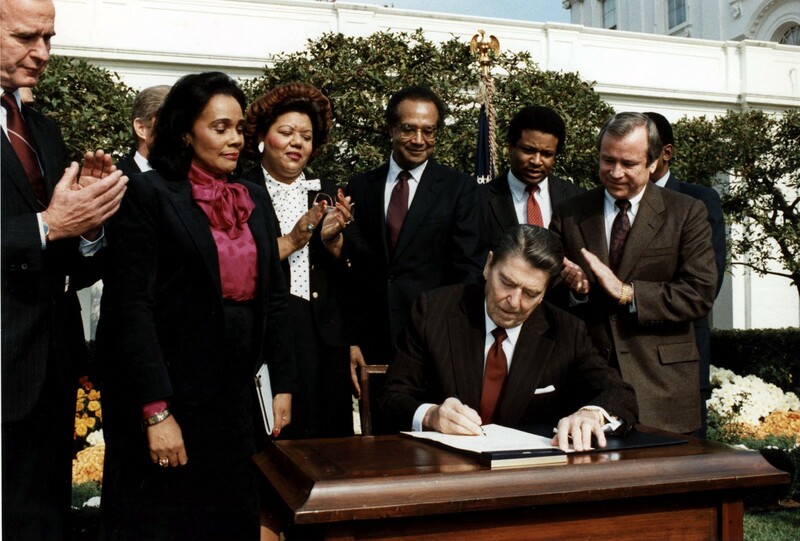 Reagan signed the bill into law in November, 1983 but the holiday was not officially observed until the third Monday of January, 1986. For many years to come, certain states refused to honor the holiday until in 2000 South Carolina became the final state to recognize Martin Luther King Day. 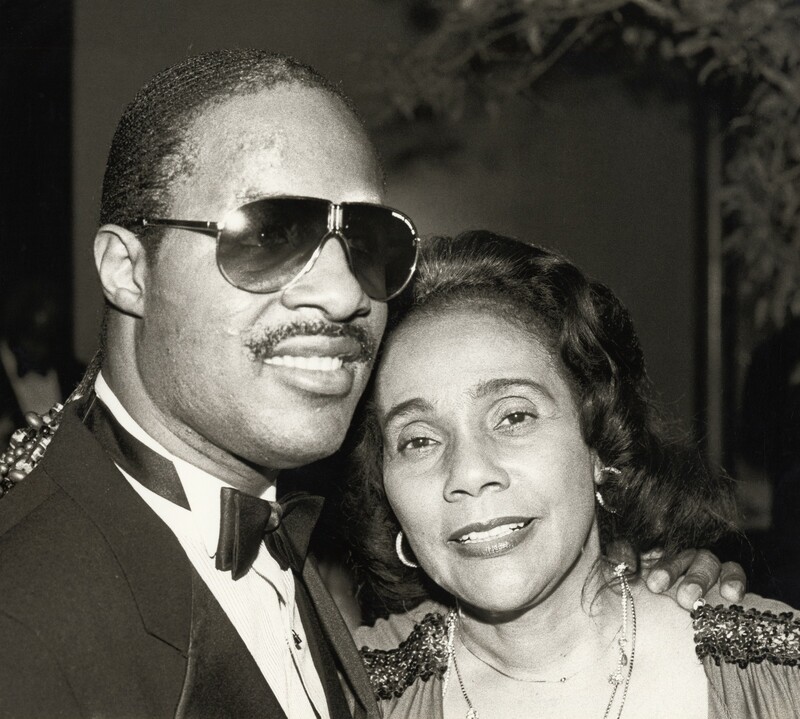 Coretta Scott attends the signing of Martin Luther King, Jr. Day by President Reagan on November 2, 1983 | President Obama presents the Medal of Freedom to Stevie Wonder in the White House on November 24, 2014. The Medal of Freedom is the country’s highest civilian honor. 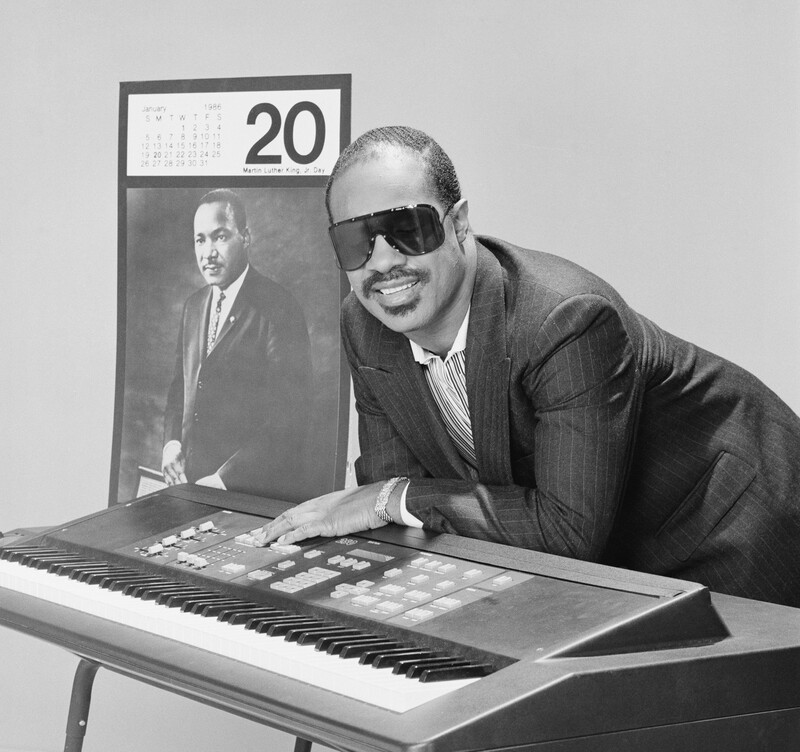 Stevie Wonder continues to celebrate King’s birthday with frequent performances. 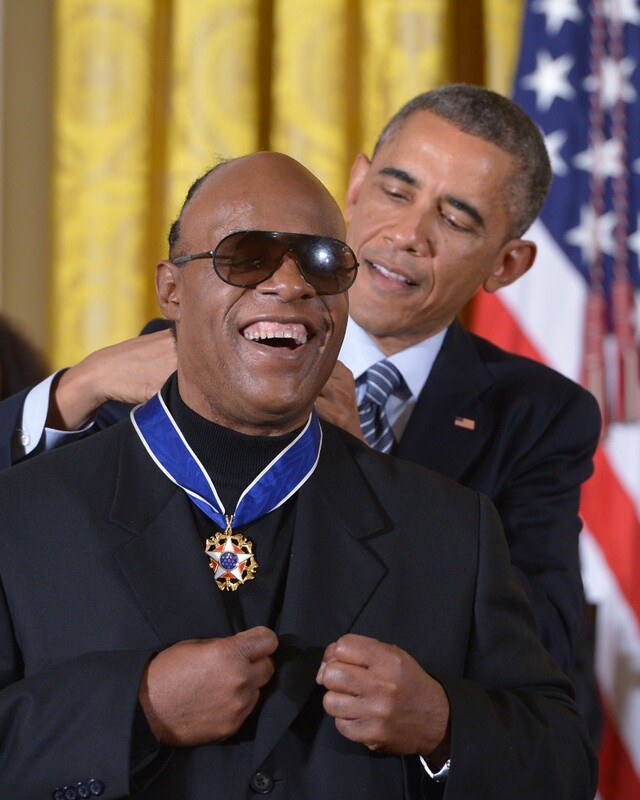 On November 24, 2014, he was honored with the Congressional Medal of Freedom at the White House by President Obama, who told the singer that the first record he ever bought was by Wonder.